The following was written by Bible and ministry professor Michele Hershberger, who is leading a three-week inter-cultural class in Philadelphia. Do we take God to the city? Or do we find God in the city? Those are two very different questions. They emerge from two very different worldviews. Along with five Hesston College students, I am a part of Urban Life and Culture, an experiential Hesston College class in Philadelphia. 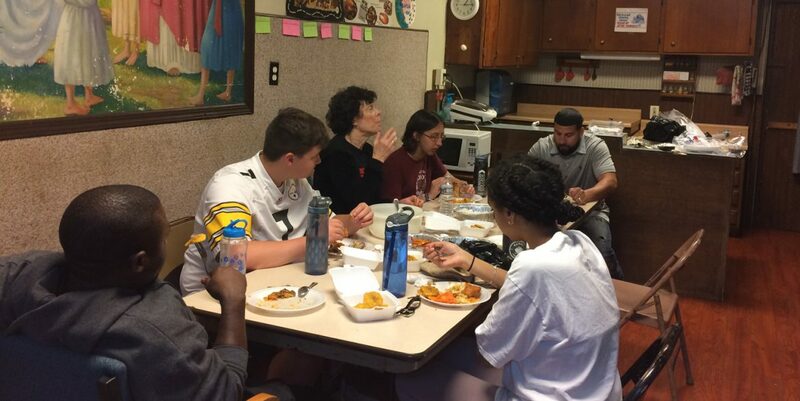 The six of us are spending time with Philadelphia Anabaptist Christians in three different cultures: Latino/a American, Asian-American and African-American. But how we answer the question above will determine what we learn these three weeks and whether or not we do significant cultural and relationship damage. It’ll determine whether or not we find God. 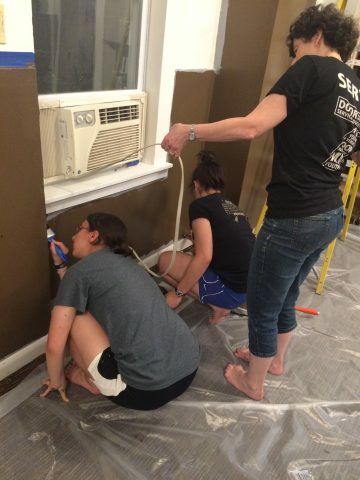 Anna Zehr (Tiskilwa, Ill.), Bible and ministry professor Michele Hershberger and Mariana Martinez (Le Ceiba, Honduras) give a room at the Crossroads Community Center in Philadelphia a new coat of paint. Many Christians tend to see themselves on a mission to take God into the city. They have their facts right…there are more people moving into cities and there are problems in our cities. But the Christian self-identity of bringing God to the city isn’t really Christian at all. It assumes that rural or suburban Christians have it all together and they are the only ones who have something–the gospel–to offer to others. This misconception nurtures self-righteousness and keeps us from seeing all the things urban Christians have to give to us. It keeps us from seeing God in the city. And God is alive and well in the city. I saw God in the city today. I saw God in the gentleness of a mother and her small child, as they stepped on the bus. I laughed with the ladies who overseeing the Pennsylvania primary elections in our neighborhood. When I told them about our class, they said they’d pray for us. I listened as Pastor Juan said hello to everyone we passed in the hood, and they–and we–could tell he loved them. The question you bring determines the answer you find. When we look for God in the city, we see different things. Yes, there is still trash on the sidewalks and graffiti on the walls. But there are also gardens and murals–and beautiful people. Every person has a unique picture of God. When we look for that piece of God in each person, we find God. We are enriched. story. Seeking God in the city makes us less judgmental. Instead of immediately judging the prostitute on the corner, we talk to her. There’s a reason she’s there, a story. Perhaps she was molested at age 11 or forced to do things she didn’t want to do. There’s always a story. Seeing God in the city keeps us humble. We hear stories of unfailing faith, stories of God’s miraculous providence. We receive warm hospitality in the surprise gift, the warm handshake, the delicious food. We receive so much more than we give. I see God in Pastor Juan Marrero. He walks with people from the neighborhood he grew up in, the Black and Puerto Rican neighborhood of Fairhill. He baptizes mothers and sons. He counsels young men who need jobs or to get off drugs–or both, because as Pastor Juan would say, there is a correlation. So for him and his ministry, it is about Jesus but it’s also about getting people jobs, treating others with dignity and speaking out against unjust structures that keep people in poverty. Even more, Pastor Juan knows that the people in his hood have love, faith, humor and grace to give to him and that they need to give and that he gains so much as he receives. He looks for God in the city every day. He represents Jesus in the city every day. It’s true that we are to “take” God wherever we go. But perhaps we don’t earn the right to tell others about Jesus until we come with humble, nonjudgmental hearts, looking for the God who is already there.